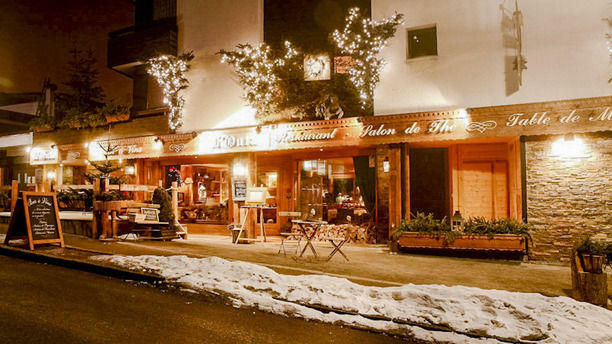 CUISINE DE MONTAGNE - À 50 mètres de la piste principale des Gets « Les Chavannes », au cœur de la Haute-Savoie, un restaurant traditionnel cosy, à l’ambiance jazzy et à la déco design et boisée. À la carte du restaurant L’Outa, des plats typiques français à déguster en salle ou en terrasse. ON DÉGUSTE - Salade de profiteroles au chèvre chaud, oie gras au miel de montagne, rôti d'agneau aux herbes, carpaccio de canard au poivre de Sichuan, filet de bœuf aux girolles fraîches, escalope de ris de veau rizotto aux girolles, filet de fera sauce vierge, sabayon de fruits rouges au Genépi. Great food and very friendly and helpful staff. Seafood specials were excellent. Restaurant decor was lovely, cozy, and charming. The fish and meat dishes we ordered were beautifully cooked and delicious. Probably best not to be in a hurry as the service can be a little slow. Very good food and service, but bring plenty of cash to pay the bill! Ordered the special, 15 minutes after we finished our starters, we were told our main courses weren’t available and so had to chose something else, despite seeing what we ordered being served to another table later on. No apology, no compensation (such as even offering a coffee). Desert order then mixed up also. Wouldn’t be in a hurry back. Lovely aymosphere and amazing food! Nicely appointed restaurant with large well decorated tables. Food was beautifully presented and dishes enjoyed by all the party and that included the fussy eaters amongst us. Comprehensive wine list and friendly professional service from the host and his wife. Would certainly recommend a visit. Very simply...... Great food and great service. Ate here twice this week and was very impressed both times. Will definitely eat here again and could not reccemend more highly. Great food and great service. Would 100% recommend. Nice food but very slow service. Starters disproportionately expensive compared to main course. My dinner was delivered twice. On both times it was cold.By the time it was delivered my wife had eaten her dinner. No recompense for the full price of the meal was offered. Really freash ingredients however ordering coffees and desserts took a while. Been there many times and I have never been disappointed. Super nice atmosphere and very nice people!! We've been to L'Outa before and really enjoyed our meal there, that's why we returned. However, last night service was really bad, not in the sense of unfriendly, but very inattentive. There was only one more table occupied and yet they were not able to serve our wines on time, qe had to remind them 3 times that we had ordered wine. Quality of food was good though, but very expensive.